In 1791, the U.S. Secretary of War (the precursor to the Department of Defense) issued an order outlining the required clothing for officers in the Navy. It provided a distinctive dress for the officers who would command the ships but did not include specific instructions for enlisted sailors. The usual dress of a seaman was made up of a short jacket, shirt, vest, long trousers, and a black low-crowned hat. 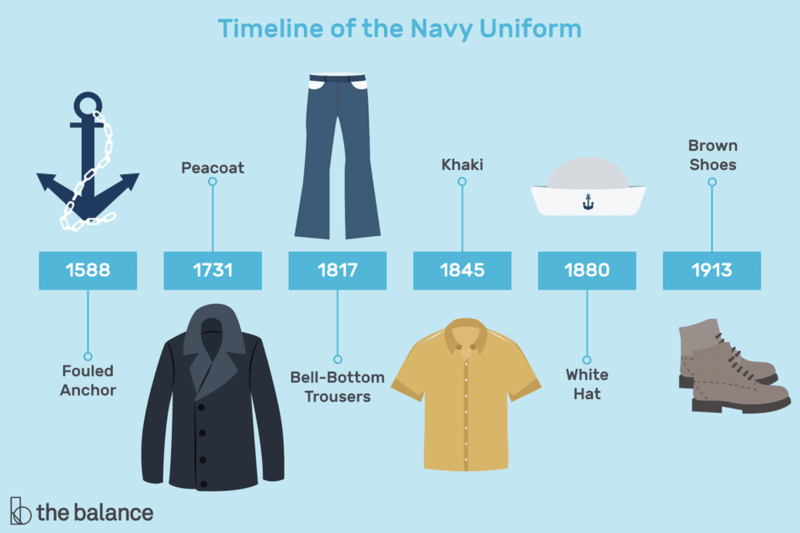 In 1802, the U.S. Secretary of the Navy set the colors of the Navy's uniforms: blue and gold. Over the years since, there have been some additions to the required clothing for Navy personnel, but the blue and gold have remained. The foul anchor as a naval insignia comes from the British Navy. The symbol got its start as the seal of Lord Howard of Effingham, Lord Admiral of England at the time of the defeat of the Spanish Armada in 1588. During this period, the personal seal of a great officer of state was adopted as the seal of his office. The fouled anchor still remains the official seal of the Lord High Admiral of Great Britain. When this office became part of the present Board of Admiralty, the seal was retained on buttons, official seals, and cap badges. The U.S. Navy's adoption of this symbol and many other customs can be directly attributed to the influence of British Naval tradition. Khaki originated in 1845 in India where British soldiers soaked white uniforms in mud, coffee, and curry powder to blend in with the landscape. Khaki pants made their debut in the U.S. Navy in 1912 when they were worn by naval aviators, and were adopted for submarines in 1931. In 1941 the Navy approved khakis for on-station wear by senior officers, and soon after Pearl Harbor chiefs and officers were authorized to wear khakis while ashore on leave. In 1913 high-laced shoes of tan leather first were authorized for wear by aviators with khakis. The color changed to russet brown in 1922. Uniforms exclusive to the aviation community were abolished in the 1920s and reinstated in the 1930s. The authorized color of aviators shoes has alternated between brown and black since then. The peacoat is a cold weather version of the first uniform authorized, the pea-jacket. The warm, heavy coat is made from "Pilot" cloth, a course, stout kind of twilled blue cloth with a nap on one side. It is commonly believed that the trousers were introduced in 1817 to permit men to roll them above the knee when washing down the decks and to make it easier to remove them in a hurry when forced to abandon ship or if washed overboard. The trousers may be used as a life preserver by knotting the legs. There is no relationship between the 13 buttons on the trousers and the 13 original colonies. Before 1894, the trousers had only seven buttons and in the early 1800s they had 15 buttons. In 1852 a white cover was added to the soft visorless blue hat. In 1866, a white sennet straw hat was authorized as an additional item. During the 1880s the white "sailors hat" appeared as a low rolled brim high-domed item made of wedge-shaped pieces of canvas to replace the straw hat. The canvas was eventually replaced by cotton as a cheaper more comfortable material. Many complaints on the quality and construction led to modifications ending in the currently used white hat. Officers' stars were first approved for line officers' uniforms in 1864. All regulations since 1873 have specified that one ray would point downward toward the gold stripe on the sleeve. The reason for this is unknown. In 1876, three stripes on the collar were proposed for all grades, with the stripes on the cuffs to indicate grade. One stripe for E-1, etc. In 1841, insignia called "distinguishing marks" were first included as part of the official uniform. An eagle and anchor emblem, a forerunner of the rating badge, was the first distinguishing mark. In 1886 rating badges were established, and some 15 specialty marks were also provided to cover the various ratings. In 1893, petty officers were reclassified, and the rating of chief petty officer was established. Until 1949, rating badges were worn on the right or left sleeve, depending on whether the person concerned was on the starboard or port watch. Since February 1948, all distinguishing marks have been worn on the left sleeve between the shoulder and elbow. The black neckerchief or bandanna first appeared as early as the 16th century and was utilized as a sweatband and collar closure. There is no truth to the myth that the black neckerchief was designed as a sign of mourning for Admiral Horatio Nelson's death. The first enlisted women's uniform was comprised of a single-breasted coat, blue in winter and white in summer, a long skirt and a straight-brimmed sailor hat, blue felt in winter and white straw in summer, black shoes and stockings. It's evolved since then and now female sailors dress in the same uniforms as their male counterparts. This decoration was established in 1960 to recognize the responsibilities placed on those officers of the Navy who are in command, or who have successfully commanded, ships and aircraft squadrons of the fleet. The component parts include a commission pennant, an anchor, and the line star. In 1917 the "Forestry" green uniform of the U.S. Marine Corps was authorized for aviation officers as a winter working uniform. The earliest use of the uniform by enlisted men came in 1941 when chief petty officers designated as Naval Aviation Pilots were authorized to wear the uniform. Gray uniforms in the same style as khaki were first introduced on in 1943 as officers' uniforms. The Navy abolished the use of "grays" in 1949. First authorized in 1852, the flat hat was eliminated in 1963 due to nonavailable materials. A hat worn by officers with ceremonial uniforms, a cocked hat, commonly referred to as a "fore and aft" hat, was worn during the 1700s. It was discontinued in 1940. A short saber with a cut and thrust blade and a large hand guard, the cutlass was issued to enlisted men as a sidearm and maintained in ships armories until the beginning of World War II. The weapons were officially declared obsolete in 1949. The cutlass was considered an organizational issue item but was never considered to be a part of the enlisted uniform. For many years the U.S. specified modified forms of the Napoleonic eagle in the devices and insignia used to distinguish the various ranks and ratings of enlisted men and officers. This eagle was usually cast, stamped or embroidered facing left, and the same practice was used by the Navy. Why the Napoleonic eagle faced left is unknown. In 1941 the Navy changed the eagles' appearance to follow the Heraldic rules, which face right toward the wearer's sword arm. This rule continues to apply, and the eagle now faces to the front or the wearer's right.